euroTECH offers handling and transport solutions in the field of vacuum technology. The company develops, produces and sells customer-specific vacuum systems and components for automated handling tasks. Thanks to the euroTECH modular construction system, the components can be flexibly adjusted to meet individual customer requirements and spare parts can be installed in a quick and cost-saving manner. euroTECH Vertriebs GmbH is an innovative and customer oriented company with international focus. Their network of partners extends over numerous countries around the world. 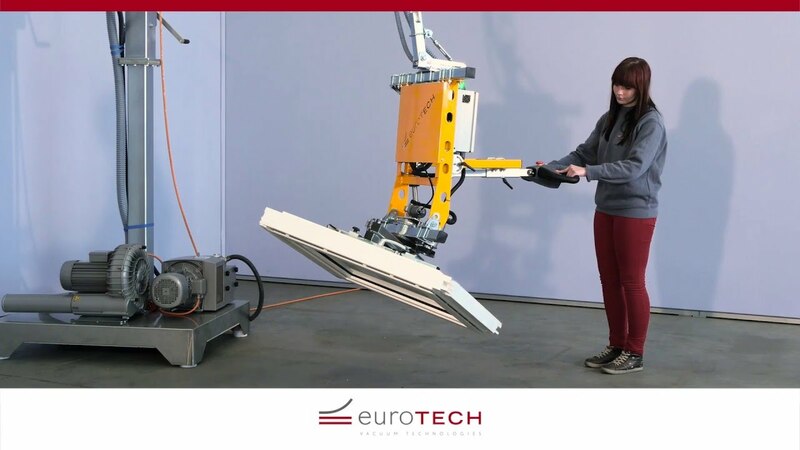 The euroTECH mission: In addition to the development of serial products, the focus is on the solution of individual handling tasks from the customers. The modular designed eT-Hover-allround is a practical, versatile lifting device. With a relatively low weight the equipment can handle loads of up to 500 kg and is capable of horizontal and vertical lifting, swivelling, rotating around 360 degrees, as well as any combination of these types of movements. All movements can be controlled precisely and intuitively with the ergonomically designed control unit. The name "allround" relates to the extensive functionality of the lifting device as well to euroTECH's breath of performance. The eT-Hover-allround lifting device enables vacuum-sealed objects, such as sheets of glass, sheet metal, plastic or wooden panels, to be handled in the most versatile ways. The new vacuum handling tool from euroTECH does not just cope with vertical or horizontal lifting: if required these lifting functions can be combined with swivelling movements from horizontal to up to 90 degrees vertical. By integrating an electrical rotary drive, the lifting device can endlessly rotate loads around 360 degrees without encountering a stop, enabling the entire spectrum of lifting and positioning tasks to be reliably executed. The Eurotech eT-Lift tube lifters are versatile lifting and positioning devices that are suitable for almost any application. They simplify work wherever loads – wooden, plastic, metal boards or glass panes – need to be lifted quickly, easily and flexibly, moved from one storage location to another, rotated, stacked or consigned for shipment. You can effortlessly switch between loads thanks to a wide range of change tools and a quick-change mechanism on each eT-Lift. The eT-Lift-mini with a net weight of 6 to 10 kg and lifting heights up to 1,200 mm accepts loads up to 45 kg. The eT-Lift-eco and eT-Lift-flexi with a net weight of 11 to 15 kg and standard lifting heights up to 1,700 mm can move objects up to 125 kg. euroTECH plans and realises user-specific vacuum tube lifter concepts both for new systems and also solutions for integration into existing operating processes. From concept through to commissioning, and if desired, including optimum positioning and fastening, craning-in and control. The recently enhanced vacuum suction boxes "LG" (LG = light generation) of the eT-Gripper product family from euroTECH are even lighter than their already weight-reduced predecessors "NG" and thus represent an ideal alternative to suction plates, flat vacuum cups or vacuum cleaner rugs. The re-designed frame profile is, as with the NG series, very light and therefore highly suitable for portal and robot applications. With the new, self developed valves, even more weight can be saved now, since they are made of very lightweight plastic. The smart arrangement of these flow control valves, the flow limiters and the choice of materials combine to ensure optimum and reliable holding power for a wide variety of applications. euroTECH's new vacuum suction boxes are suitable for handling products with smooth, undulating or extreme structured surfaces. Format changes can be achieved in no time thanks to a practical quick-change system, and wear parts can be exchanged quickly and cost-efficiently. The lifting devices of the eT-Hover-modesty series are used for lifting vacuum-tight, flat loads such as glass panes, sheet metal and plastic or wooden boards. They have a simple design and are used as cost-saving alternatives to similar, more extensively equipped devices. The eT-Hover-modesty is equipped with two handles for easily manoeuvring and positioning. a telescopic design, allowing the device to lift loads with a weight of up to 600 kg sized 2,000 x 1,500 mm or 2,400 x 1,500 mm. have a relatively low tare weight. Whenever a separate vacuum generator (e.g. on the crane) is used, the device can be used without its own vacuum generation function. Additional suction cups can be added depending on the task at hand. The type, size and order of the suction cups is based on the type and size of the load to be handled. Several safety and alarm systems ensure the necessary level of safety to prevent faults and risks in accordance with DIN EN 13 155. The term "vacuum components" contains all sorts of suctions plates, flat suction cups, bellow suctions cups, vacuum generators and the entire range of accessories from euroTECH Vertriebs GmbH. These are compatible construction units that can be mounted on an existing system. euroTECH developes and produces complete vacuum components by making use of a wide modular system. These suction plates are applied in the glass, wood industry as well as in the plastic and metal industry and many more. Seals of various sizes and made of various materials are used depending on the surface and the area of application. They are available in our common materials like e.g. NBR black, NBR grey, as well as transparent silicone. surface (grooves, burls, support bars) and the internal volume of the seal play a major role. The correct material to be selected depends on the specific application Situation. For its latest mechanisation component, a scissor lift loading unit, Maka System's, located in Nersingen, Germany, has enlisted the vacuum experts from Eurotech Vertriebs GmbH. To prevent suction marks after the installation of glass panes, the vacuum experts at Eurotech Vertriebs GmbH, headquartered in Geislingen near Balingen, have developed and patented a suction plate cover. Eurotech will be presenting some of its specialist products at the FENSTERBAU FRONTALE trade fair in Nuremberg, Germany. Beside many other products, some lifting devices will be in focus. Depending on requirements, the eT-Hover-allround or eT-Hover-modesty are able turn loads.